Whitby. Photo by the writer. Daniel Day-Lewis has been seen (early 2017) in Whitby, where he is believed to be making his first film since Lincoln in 2012.It seem, too, that he has been reunited with There Will Be Blood director Paul Thomas Anderson. Some insiders think the film will be set in the London (or New York) fashion world of the 1950s. It appears to have nothing to do with Bram Stoker’s Dracula, until now the most famous piece of fiction associated with the town, tucked cosily down a deep valley on the North Yorkshire coast. 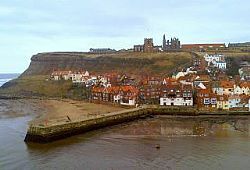 I visited Whitby recently. It is one of our most perfect little seaside resorts, and an ideal short getaway destination easily reached by train. My must-do list includes some of Britain’s best fish and chips, lashings of Gothic horror, 199 famous steps, a hotel where Lewis Carroll stayed, the statue to a great explorer and a peek into a jet black past. My entrance to Whitby was more sedate than Dracula, who smashed straight onto the beach in the harbour (….“leaping from wave to wave [the strange schooner] rushed at headlong speed, swept before the blast…”) I came by train, up the attractive Esk Valley. It’s a good option for a long weekend, as you won’t need a car in this small town. Occasional steam trains run here over the North Yorkshire Moors from Pickering. You can walk round town in half a day. Start on West Cliff at the whalebone arch (a memorial to Whitby whalers), and the statue of great discoverer James Cook, who began his seafaring life here. Over the ancient swing bridge is the old town with its narrow ways, cobbled streets and shops selling the town’s famous black jet jewelry. One of the most powerful images of 19th-century bravery is a photograph of Henry Freeman, in the new cork flotation jacket. He was the only crew member of the Whitby Lifeboat wearing it when the vessel was sunk in a storm just outside the harbour in 1861, and the sole survivor. The photo is perhaps the best known work of Frank Sutcliffe, whose pioneering lens ranged widely over people and places in and around the town. You can see some of his output in the Sutcliffe Gallery (part of the town’s Flowergate Gallery). And it’s worth the walk up to Pannett Park to see the artists’ take on the town, from peaceful harbour scenes to the bombardment in 1914 by two German battlecruisers, in the Whitby Art Gallery and Museum. My fish (roasted brill with braised vegetables, Yorkshire belly pork, caramelised apples and a cider and wholegrain mustard cream) came from the Good Intent, Abbey Lee, Maggie M, Our Lass II, or perhaps one of the otherfrom the small Whitby fishing fleet. I know tis because chef Rob Green lists then all , and their captains, on his menu at Greens restaurant. He’s down on the quayside every day to see what they’ve caught, sourcing his product from them “wherever possible”. In 2009 Rob won the fish industry’s Seafood Chef of the Year award. www.greensofwhitby.com. There are plaudits too for the town’s rich list of chip shops, led by the eminent Magpie. Rick Stein said it showed him how good a chip shop could be. Prepare to queue. Charles Dodgson (Lewis Carroll), sensible fellow, spent his holidays in this fashionable Victorian resort, staying six times at 5 East Terrace, high on West Cliff. The link with such a brilliant imagination inspired the new owners to reopen it as La Rosa Hotel, in 2008. Think Victorian theatre set. There are no telephones, televisions or showers (the roll-top baths are decadently inviting). They furnished the eight (individually themed) rooms with antique brass beds, black and gold eiderdowns,, vintage wallpaper, old writing desks, battered suitcases, and a display cabinet full of Carroll’s own things. My room, with a view over the town, was as red and sultry as a courtesan’s boudoir, complete with saucy period photos. Breakfast was a hamper in my room. www.larosa.co.uk/hotel. Bram Stoker stayed around the corner in the Crescent, a worthy Victorian attempt to emulate the Bath namesake. I travelled by train via Middlesborough. A connecting bus service runs from York to Whitby. Advance returns, online at www.eastcoast.co.uk.